***Program Update: We have now extended our Giving Program through the end of December 2016, so please continue to share with your networks and be sure to sign-up if you haven’t already! I have a secret. Ok… Not really a secret, but not something I necessarily shouted from the rooftops when I was younger. I was a Girl Scout until I was almost 18. While this wasn’t the common path for most girls in my grade, I believe it was one of the key factors that set me apart when applying for schools and my first job. On applications, I was able to relate my experiences in scouting and community service projects to goal setting, project management and problem solving. It is so important for young women in our society to have a network available to them, and to empower them with resources and skills for future endeavors. That’s why I am so passionate about the cause we’re highlighting today as part of our SparkPost giving program. While coding wasn’t prevalent among girls when I was in school, it has become a powerful driving force in the tech community among women and around the globe. Girls Who Code is a non-profit organization dedicated to closing the gender gap for girls in technology. Specifically, they focus on teaching girls the Core4 computer science concepts that form the basis for all computer programming languages, along with valuable technical and problem solving skills. Through their programs, they are building the largest pipeline of future female engineers in the United States. Program participants are majoring in computer science at top universities across the US. Over 20 major companies have pledged to hire Girls Who Code alumni. Over 40,000 girls have participated in their programs and counting! For girls in 10th & 11th grades, Girls Who Code offers Summer Immersion Programs, exposing participants to tech jobs and corporate work environments. For 7 full weeks, girls get on the job training at companies like Facebook, Microsoft and AT&T. The girls listen to guest speakers, participate in workshops, connect with female engineers and entrepreneurs and even go on field trips. The program culminates in a final project where they build their own products and share with their class. If you or someone you know might be interested in the Summer Immersion Programs, you can sign up for the Girls Who Code mailing list and get notified when applications open in January! Girls Who Code also offers after school Clubs throughout the United States, open to 6th-12th graders. Hosted in schools, community centers and libraries across the country, the free Clubs meet for 2 hours per week, either after school or on the weekends. In addition to computer and internet access, Clubs provide a supportive network of peers and mentors for all girls who attend – as I mentioned above, an invaluable resource! 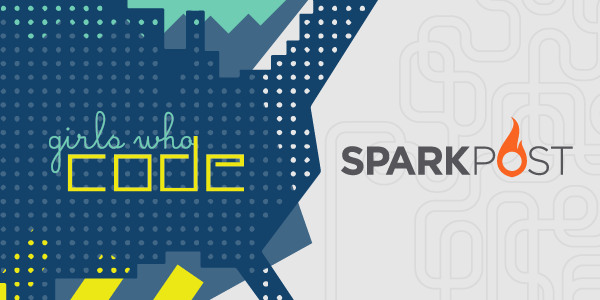 Sign up for a SparkPost account today and select Girls Who Code as the cause you’d like us to donate to. Already have a SparkPost account? Share this post on Twitter, Facebook, or with family and friends. Want to do more than just donate? Check out how you can get involved in facilitating a club, or get your company involved as a corporate partner. Our step-by-step guide will teach you how to make your event booth video file play on a low-cost device such as an Amazon Fire TV Stick.